Allow me to introduce you all to Jill from Doused in Pink. I happened upon Jill’s blog when I was reading comments on another blogger’s post and her blog name caught my eye. Once I clicked over and saw her awesome style on a budget, I knew I had found a new blog to follow! Jill really makes the most of her clothing budget (seriously–check out some of her awesome deals here). I love the outfits she puts together, and I know you will too! A few weeks ago when Tif asked me to be a guest blogger for her Wardrobe Re-Wear series, I was thrilled! I love to get the most mileage out of my wardrobe and styling the same piece several ways. 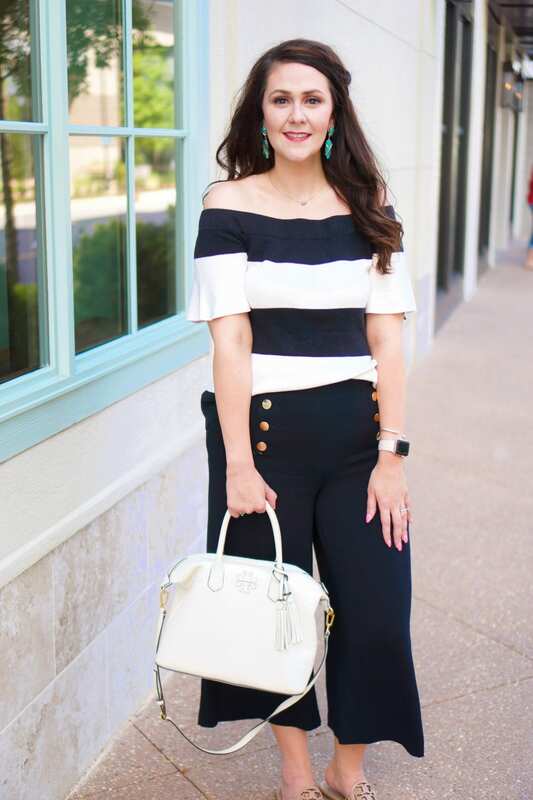 I got this maxi skirt from Old Navy for a steal using Gap Rewards and it is such a versatile piece in my closet, it has been on repeat all summer! Here I paired the skirt with a tank and sandals. I added a few bracelets and a statement necklace to complete the look. When it’s blazing hot in the summer, maxi skirts are the best option to stay cool. This was the perfect outfit for walking around town and having dinner outdoors. For date night with the Hubs, I wore the skirt as a dress by adding a wide belt. Then I threw on a jean jacket and booties. I have worn maxi dresses as skirts before, but this was the first time I have worn a maxi skirt as a dress. I have to say, it was super comfortable and I will definitely be wearing this again! Be sure to head on over to Doused in Pink and check out the rest of Jill’s style on a budget! Tif – thank you so much for having me as a guest on your blog! I'm so excited to be here! Love Jill and love the looks!! new follower here! Great post, Jill! Maxis are so versatile! Great post! I've never thought of wearing the skirt as a dress. Neat Idea! I love Jill's blog – so glad to follow her over here and find you! I love how Jill remixes things – every single outfit is so cute! Cute! I love when people are able to repurpose a specific piece of clothing. Great idea to use as a dress also! I think that skirt lends perfectly to it, too. I currently only have one maxi skirt and it has a band at the top that really wouldn't fit me well up top, but I will be keeping an eye out for something more like this to go on sale! Love the top in the first outfit as well! Love the maxi as a dress! Love that you rewore the maxi! It's perfect in the top photo and surprisingly awesome as a dress in the bottom! I have a few maxi's I'd like to do this with! The outfits look great! Can definitely tell that skirt is so versatile. Love those shoes with the maxi skirt as dress! You look lovely Jill! That skirt is adorable on you and I really like both looks! And you know I'm excited to have you! One thing I've learned is blogging is all about community, and I'm glad you're in mine now! Glad to have you, Shaunacey:) Your name is super close to my husband's name (Chauncey) so I had to double-check my spelling as I was writing this. Jill did an excellent job! Becky, Jill's post made me realize how much I need to find a maxi that I can wear like this. For example, one of the maxis I have is sheer from the knees down.lol Another has a funny band at the top. Definitely take the top band into consideration the next time I purchase one! I'm in love with Jill's idea! Thanks for stopping by, Lana:) Jill definitely has great style and an eye for pairing outfits! Thanks for stopping by, Susan. I think Jill gave all of us some outfit inspiration! Jill's idea makes me wonder why I hadn't thought about this before! It doesn't even look like the same piece of clothing! Jill did awesome on this Wardrobe Re-Wear. Simple and easy, but something unexpected that you wouldn't always think of! Thanks for stopping by! Those shoes Jill has on are spot on! Thanks for stopping by, Maria! I'm jealous that both of you have that necklace–it's a great piece! Thanks for stopping by, Laura. Jill nailed both looks, that's for sure! Hi Tiff, I am Ada. I just found your awesome blog and I am so happy I did. I am a mom on a budget also and I love re-mixing my closet so please check out my blog as well. Jill is great. Love her style. She did a great job remixing that awesome chiffon blush maxi. You got a new fan and follower in me, by the way. OMG in love with this maxi! You're rockin it girl! I love the maxi skirt as a dress. Brilliant. First, I really want that necklace in the first photo… I think it is from Stella & Dot, but I've been seeing it everywhere. And secondly… I never thought to wear a maxi skirt as a DRESS!!! This is brilliant!! Jill really nailed the look–the necklace is so pretty! Great way to re-wear the maxi skirt for sure! Thanks for stopping by! I'm heading over to your blog now. I've been a little overwhelmed by life here this past little bit and am just now catching up on comments!